Busy week on my end, getting ready to start two new on-line class on 2 October, supporting the Red Cross, working a large set of client projects and getting ready to head to London and www.cosac.net. Thanks to Strategic Communications and Public Diplomacy “Seen on the Web” (#85), September 16, 2017 for the article triggering today’s post. MISO personnel are working with the Uganda People’s Defence Force (UDPF) to help them learn the non-kinetic skills needed to conduct successful influence campaign. (See: http://bit.ly/2yAhB8d, which is also the photo source). 1. Phase 1 – US led and US assisted. 2. Phase 2 – U.S. taught and UPDF assisted. 3. Phase 3 – UPFD taught and US assisted. 4. Phase 4 – UPFD taught and UPDF assisted. US personnel serve as observers, controllers and trainers. 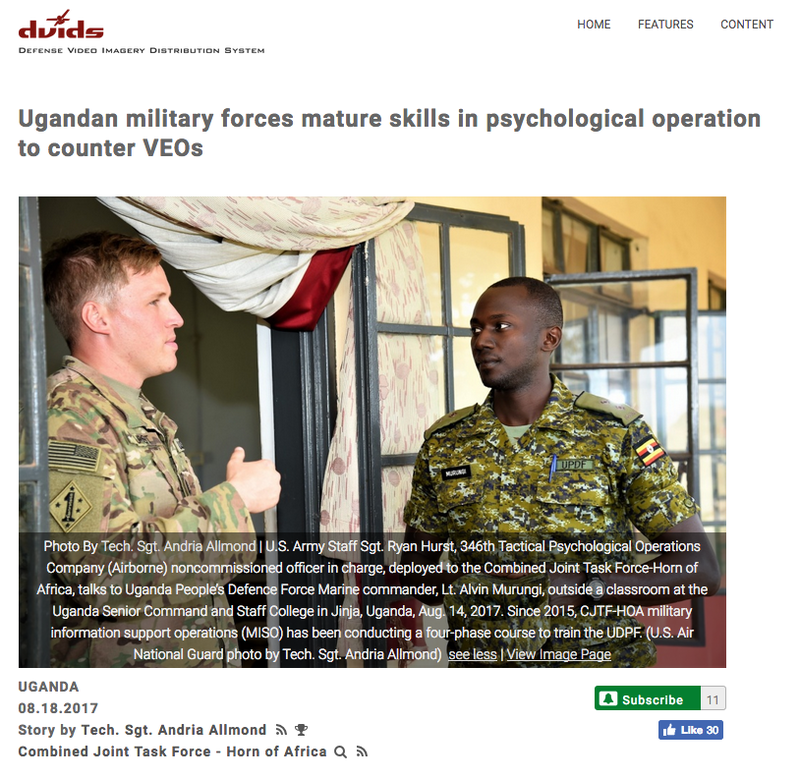 The article quotes Maj. Allan Kitanda, UDPF Psychological Operations staff officer, who said that the U.S. contribution to the mission of neutralizing and containing VEOs like al-Shabaab and Boko Haram has been “immense.” He asserted that the U.S. government’s participation in cultivating the UDPF’s psychological operations is critical in preserving civility amid necessary kinetic forces used by AMISOM to battle VEOs. 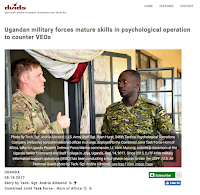 “Most recently, Soldiers of the 346th Tactical Psychological Operations Company (Airborne), out of Columbus, Ohio, have been facilitating the third phase of the program for UPDF members at the Uganda Senior Command and Staff College. It’s gratifying to see the Reserve PSYOP force in play for an appropriate, challenging and important mission. 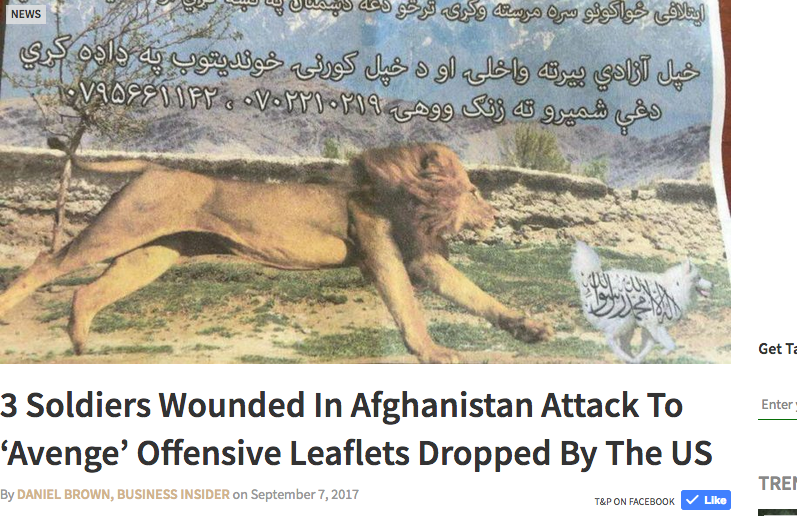 Apparently it was amateur hour in the leaflet production campaign in Afghanistan. 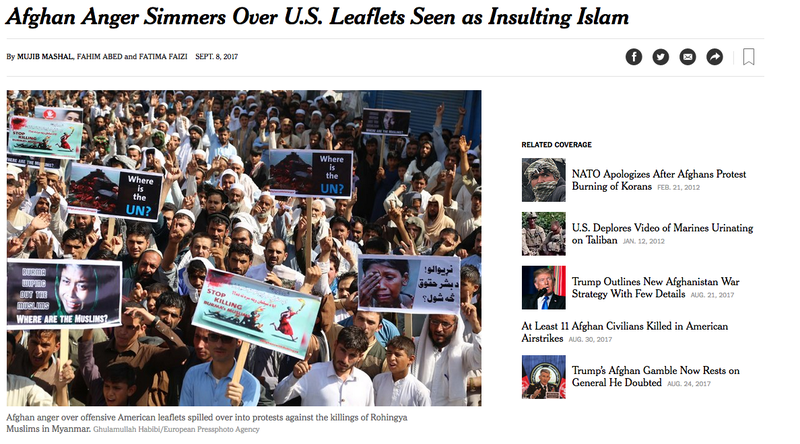 The http://bit.ly/2gYdTkw) was dropped in Afghanistan in early September 2017 broke some of the most basic rules by quoting the Quran. (see: http://nyti.ms/2eSdknQ, which is also a photo source). IN addition to the suicide bomber noted above, additional reaction is shown in the picture at left (photo source: http://nyti.ms/2eSdknQ). At issue was the use of words from the Quran in a leaflet. Frankly, you would have to be living in a cave for the last 16 years if you didn’t realize that the Islamic faith takes their Holy Book and their Prophet far more seriously than other religions. The Charlie Hebdo killings in 2015 (see for example: http://nbcnews.to/2xgTmxG) and the 2012 incident where US troops burned the Koran (see: http://bit.ly/2wlsGb4) are only two of the incidents that serve as very good bad examples and should have put everyone on notice of what to expect. Know your audience is the first rule of PSYOP/MISO and of course any influence operation. The blatant ignorance displayed by the leaflet creators and those in the approval chain should be considered MISO malpractice. If these leaflets were created by an outside contractor, this type of malpractice should be considered a material breach of their contract. The contract should be terminated immediately and consideration should be given to litigation for damages to the Coalition campaign and reputation. As for the notion of yet more cultural training – it strikes me as playing training whack a mole. When military personnel deploy they go through a pre-deployment training and certification. Current deployments to Iraq and Afghanistan must have training on Islamic traditions and protocol to include role-playing situations designed to illustrate the right and wrong ways to work in theater. There is simply no excuse for this type of ineptitude, especially in our longest running AO! 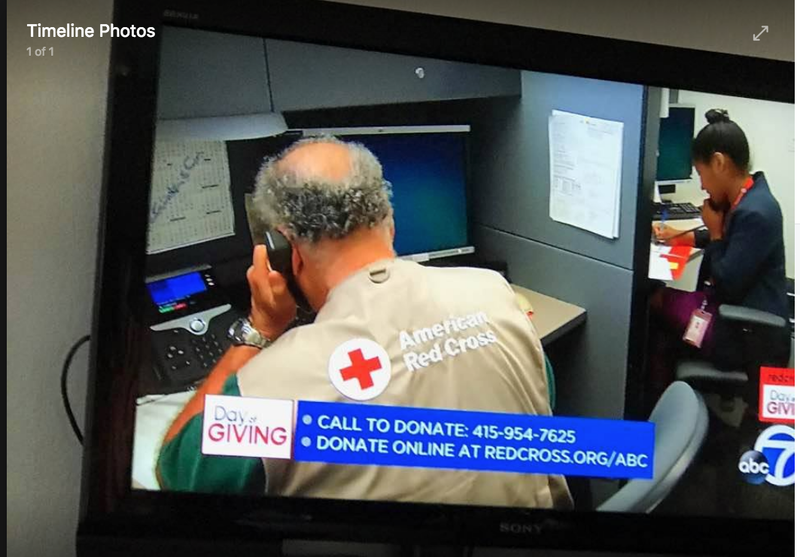 Unlike ‘real’ TV interviews that require heavy cameras, FB Live needs only a phone. Of course, having a quality microphone dramatically improves the overall quality of the experience by raising the caliber of the sound. For those of us in the PSYOP/MISO world, this underscores the importance of the Internet as an influence medium. It also means that we need to always be on the lookout for people that can be effective and credible spokespeople. An unfortunate downside is that tactical CDR at all levels may assume that they are PSYOP experts and take to the airwaves themselves. History has shown that this is generally not a good idea, but as we have discussed on the POVA page on FaceBook and elsewhere, there is not too much you can do other than damage control.